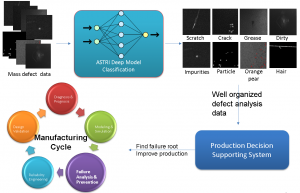 ASTRI proposes a new approach for defect analysis, namely the deep learning/machine learning based defect classification technology. The proposed deep model is tailored and optimised for industrial applications. It is equipped with precise multi-scaling mechanism to provide high precision feature extraction for high precision inspection. In addition, it has self-learning ability to adaptively adjust and tuning the model to boosting the performance. The deep model network is also optimised for high speed industrial applications. For example the network flatten technology reduces the complexity of network to speed up the testing procedure to meet the high UPH requirement from production line. Based on this technology, we can develop amazing applications for industry. For high precision inspection, the existing inspection system may encounter the noise from the manufactory environment of the production line, which causes false alert to the AOI system. The proposed technology can extract complex and multi-module features, which may be easily ignored by human to detect the noise, and prevent the false alert so that the performance can be boosted. The proposed deep learning technology can be also used as a data analysis module to classify different type of defects with the statistical data. The data is processed real-time in the proposed system, rather than taking the existing human based approach that has a time delay. In addition, this well-organised data will be used in supporting the system to improve the production cycle during manufactory.